The ‘CEFN Conwy’ project gathered data on soil quality, farm productivity and nutrient management on 50 farms over a twelve month period. This allowed the researchers to estimate accurately the nutrient requirements for those farms and whether changes could be adopted without reducing farm productivity. Soil tests showed that many farms in Conwy had soils too acid for optimum grass growth (88% of the farms had a soil pH value of less than 6). 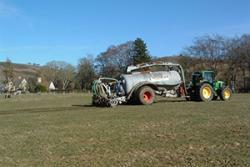 This makes fertiliser applications less effective as nutrient uptake by grass is reduced. The results indicated that grass growth would be increased by applying lime which would allow farmers to reduce the amount of fertiliser used. Modelling of the results also showed that this would also reduce loss of nutrients to streams and rivers. There is a potential down-side to application of lime, however. Carbon footprint calculations showed that liming soils to reduce acidity would result in increased emissions of greenhouse gases which cause climate change. This is because of emissions from processing and transport of lime and its impact on the soil. The study therefore revealed an important policy dilemma: whilst it may be beneficial at the local level to lime soils (for increased farm profitability and reduced loss of nutrients), this may cause some negative environmental impacts at a wider scale. The research also showed that none of the farmers were choosing to use any of the software tools that are freely available (e.g. MANNER-NPK) to help them plan their nutrient management. Reasons included a lack of awareness, competing advice from elsewhere, and the belief that adopting the same fertiliser regime every year seemed to work best. However, the researchers recommend that farmers do start to use these software tools because, combined with regular testing of soil nutrient status, they can greatly increase the efficiency of nutrient use on farms, and so improve profitability.